Steven (Chicagoland, United States) on 2 October 2009 in Architecture. 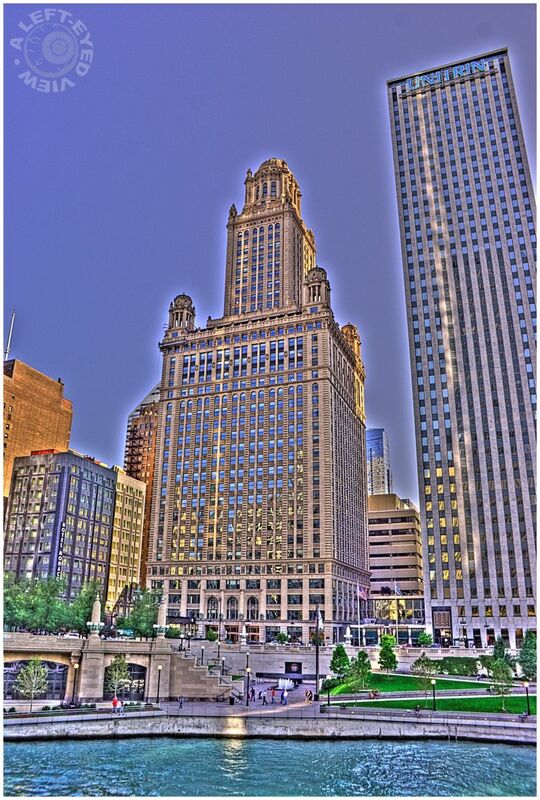 Located at 35 E. Wacker Drive, this building was created for the city’s diamond merchants and had an unusual security procedure. To reduce the chances that its tenants would be mugged walking between their cars and their offices, the building featured a central auto elevator. People would drive into this elevator and it would take them to the floor where their office was. Jewelers loaded down with precious stones and metals wouldn’t have to be exposed to a potentially hostile exterior environment. Though innovative, it was an arrangement that didn’t last very long. By the Second World War the auto elevators were abandoned and decked over to make more office space. The four turrets at the corners of the building were not for mere decoration, but were part of the building's original fire suppression system. Each turret holds a cast iron tank that would have been used in case of fire. They have since been decommissioned and the space at the base of each turret is now used as conference rooms. The building's terra cotta-clad, classical design marks it as one of the most prominent high-rise statements of the so-called City Beautiful Movement. It is also the most notable work of the partnership of Joachim Giaver and Frederick Dinkelberg, who had spent most of their architectural careers with the firm of D.H. Burnham & Company. This was designated a Chicago landmark on February 9, 1994. You can see the Chicago River Walk in the foreground with the Vietnam Memorial front and center. Photo taken September 13, 2009. Great shot, well done ! wow.. I like it very much... excellent work. Thanks for adding me to your blog watch :). That is a gorgeous building. Why don't they make them like that anymore? Oh, yeah. Money. Excellent !!! Super POV and amazing processing ! Though the architecture is monumental, this actually seems to be a cosy place, owing to the small park. You have developed a very particular style with your HDRs and I cannot get enough of them. In your processing, this building is a jewel in itself. Well I was about to write the same as Viewfinder that this building is a jewel in itself. A magnificent piece of architecture, it is wonderful to see it preserved. The history of the building is quite interesting. I have a passion for these old landmarks. The processing gives an interesting effect.